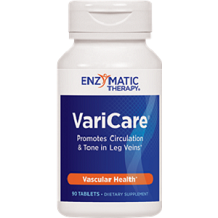 Enzymatic Therapy Varicare is the focus of our product review in this article. The manufacturer of this supplement claims that this product can support healthy circulation in the legs and promote healthy tone in leg veins. Butcher’s Broom is a plant found in Europe and Africa. The plant is known for providing relief from gallstones, varicose veins and hemorrhoids. The plant is made up of several substances such as ruscogenins, which constrict the blood vessels to reduce the appearance of varicose veins. The product is gluten-free, and suitable for vegetarians. It does contain soy however and may be allergenic if you have an allergy to soy. Take two tablets twice daily. The manufacturer did not specify if you should take with food or water, or if there is a preferred time of day to take the capsules. Consult with a healthcare practitioner before using this product if you are pregnant, nursing, or have a medical condition. You can buy the product from the official website. Each bottle contains 90 capsules and costs $29.99. The manufacturer did not offer a discount for bulk orders or incentives for new customers. Shipping costs $10 for orders under $150, and is free for orders over $150. If purchased directly from Enzymatic Therapy or Nature’s Way, you can get a credit for a future purchase within 90 days after purchase. Only unopened bottles are acceptable. 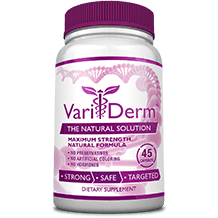 We liked that there are some beneficial ingredients in the product that can enhance your vein health. The product is gluten-free, and suitable for vegetarians. This product does not contain artificial coloring, artificial flavoring, dairy products, gluten, preservatives, salt, sugar, wheat, or yeast. If purchased directly from Enzymatic Therapy or Nature’s Way, you can get a credit for a future purchase within 90 days after purchase. Shipping is free for orders over $150. The product is let down in a number of key areas however. The manufacturer did not offer a discount for bulk orders or incentives for new customers. The manufacturer did not specify if you should take with food or water, or if there is a preferred time of day to take the capsules. The manufacturer did not provide a money-back guarantee. The per bottle price is high considering a 90 capsule bottle costs $29.99 and will only last about 22 days when taking 4 capsules per day. There is no assurance from the manufacturer that the product is made in an FDA certified facility, that its ingredients are non GMO, and that is free from binders, and fillers. Shipping costs $10 for orders under $150. Only unopened bottles are acceptable for return according to the terms of the guarantee and only for a credit for a future purchase. The product contains soy and may be allergenic if you have an allergy to soy. For all these reasons we are not able to recommend this product for the treatment of varicose veins.